A country located in the central west of Africa right under the equator, Gabon! Here, too, children who will play leading roles in the future are growing in the continuing hot weather. The Intl. 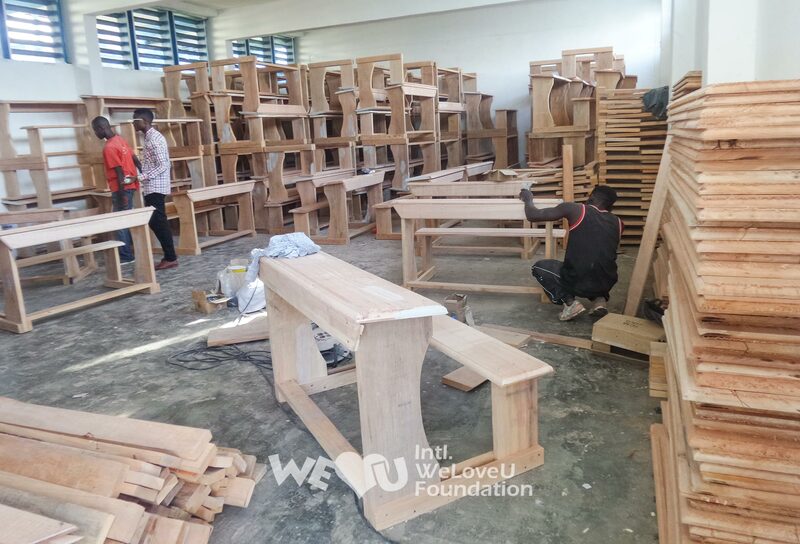 WeLoveU Foundation prepared a special gift to support Gabonese youths’ hopes and dreams; they donated 200 desks and chairs for C.E.S Jean Hilaire Aubame Eyeghe Middle School located in Nzeng Ayong in Libreville, the capital city. Nzeng Ayong is where the Clean World Movement was held in Gabon for the first time. In Gabon where the school system has five years in primary school, four years in middle school, and three years in high school, many schools are on strike because they are not supported with the government’s financial aid, and educational facilities and supplies are very old. This makes it hard for schools to teach children with books systematically, and so most schools have replaced books with temporary printouts. The situation was not much different in C.E.S Jean Hilaire Aubame Eyeghe Middle School. They only have 28 classrooms for 4,000 students of 43 classes of four grades. As the number of classrooms is not enough for students, they have morning school and afternoon school. Some classes have about 100 students. In many cases, three students listen to the class, sitting on an old two-sitter chair and a desk for two people, and some classrooms didn’t even have any chairs for the teachers. 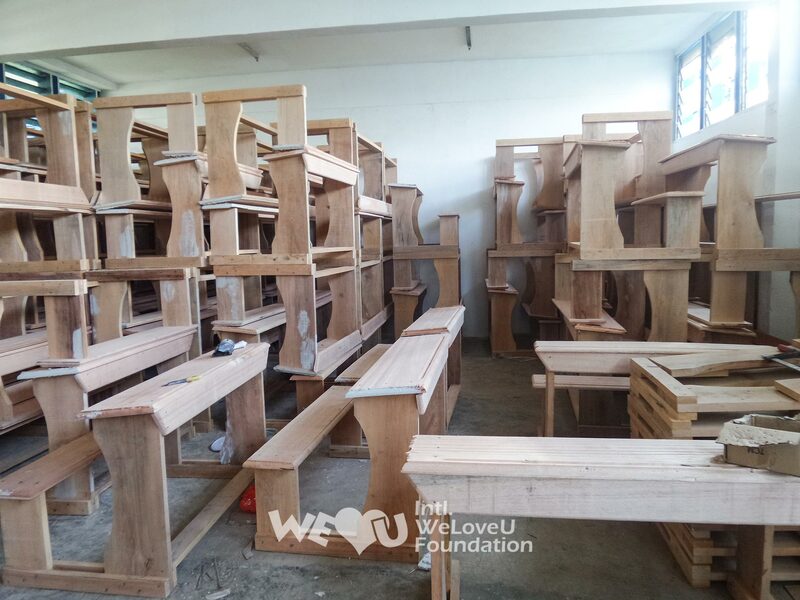 The WeLoveU Foundation saw the situations of the schools, and decided to donate desks and chairs for the students. 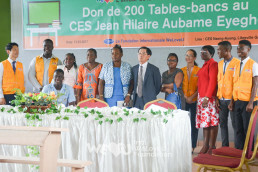 At around 10 a.m. on March 13 (local time), the desks and chairs donation ceremony was held in the auditorium of C.E.S Jean Hilaire Aubame Eyeghe Middle School. 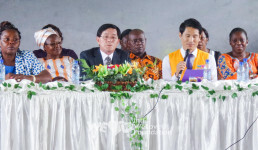 At the event, the Korean Ambassador to Gabon, Principal Maganga Mariane, teachers, WeLoveU Foundation members, and about 200 students were present. About 100 students, who could not come in the auditorium due to the lack of space, watched the ceremony, standing outside. The donation ceremony had an uplifting atmosphere full of applause and laughter the whole time. The Korean Ambassador to Gabon emphasized that youths are the future of the country, and hoped that they would grow to be people whom Gabonese society needs. He also expressed his gratitude for the Foundation’s consistent and various activities, and asked the Foundation to play the role of the bridge between Korea and Gabon. A staff member from the WeLoveU Foundation said, “The WeLoveU Foundation’s activities can’t solve lots of problems right away, but we hope that we can give a message of hope to the students who are studying in the poor environment so that they can have courage and laughter.” The students paid attention to the ceremony with smiles on their faces, and responded with a big shout and a round of applause whenever a speech ended. The press showed fervent interest; Gabon TV, Gabon’s main channel, came to cover the ceremony. 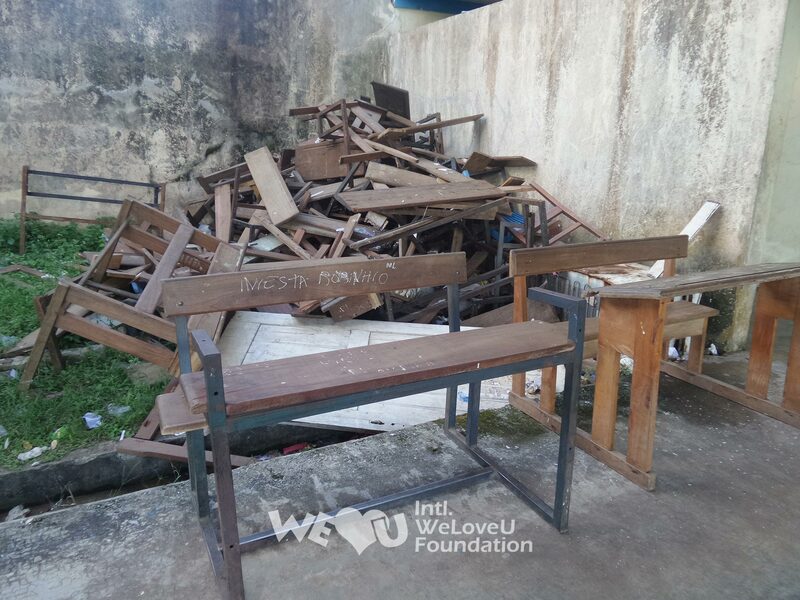 The Ministry of Education, which couldn’t participate in the ceremony due to their busy schedule, expressed their plan to support the school with 100 more desks and chairs. The WeLoveU Foundation sent the message of encouragement to Gabon, and also to youths who will take care of the future of the world. In the youths who do not lose bright smiles even in the difficult reality, we saw the bright future of Gabon.